Hello September! Summer is basically over, which means I’m putting away a ton of dresses, but not this one. This dress, which I picked up during a J.Crew factory flash sale, is made of a neoprene material. Neoprene is the same material that wetsuits are made out of! It makes it a super stretch material and totally breathable. The dress itself is crazy comfy and has front pockets that are the perfect size for my cellphone. 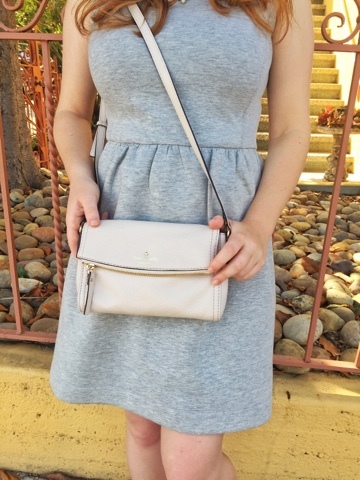 The Kate Spade Mini Carson has become my new favorite purse for Fall. With two large pockets, it’s better than most for carrying all of my essential all day items (I tend to have a lot of essentials ;)). 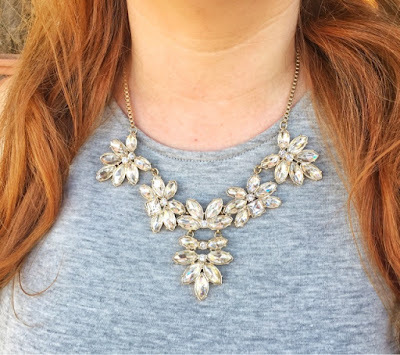 Of all the necklaces I got from Rocksbox, this has to be one of my very favorites! The Perry Street Flora Street necklace has such pretty gold detailing and crystal pieces make this such a universally loved necklace. Seriously, I feel like I can pair it with almost anything to class up an outfit. I love the signature tieks blue at the bottom of each pair of shoes. It gives it that signature look you would recognize anywhere, like the red bottom of a pair of Louboutin’s. Great dress! And to echo what other commenters have said, that necklace is a great addition to the look! So cute on you! Love it! I love the silhouette of this dress! Gray is such a great neutral. I love accessories you paired it with.